It is known that patients who use professional advice and expert dieticians and nutritional supervision have a much better chance to maintain balanced levels of sugar, and avoid the complications of the disease. Diabetics should also keep meals at regular times throughout the day to avoid sharp rises in blood sugar levels. So what are the best foods to control diabetes and blood glucose levels? You might be surprised to learn that you already have many of these foods in your kitchen. A study published in scientific journal Diabetes Care indicated that any Mediterranean diet which contains olive oil is capable of reducing type II diabetes by over 50%. This is because the oil contains monounsaturated fats like those found in seeds and nuts. These fats are essential in reducing risks of chronic diseases such as diabetes and cancer. Further reading: Health Benefits of Olive Oil. Research has displayed cinnamon’s ability to lowering the body’s resistance to insulin and decrease overall cholesterol levels within people that have type 2 diabetes. Cinnamon can be ingested in the powdered form or taken as a supplement (consult with your doctor before taking cinnamon, or other herb, in a supplement form). Ceylon Cinnamon (“true cinnamon”) is the best choice as this type of cinnamon is more closely associated with potential health benefits involving blood sugar regulation. Due to the lower sugar levels while using cinnamon, some physicians recommend avoiding other supplements on the list such as fenugreek, garlic, bitter melon, and ginseng. Further reading: How to Use Cinnamon as a Medicine. Green tea contains the antioxidant EGCG, which helps to maintain the flexibility of blood vessels and stabilizing blood glucose levels. Medical studies found that the polyphenols in green tea polyphenols have an antidiabetic effect. Researchers found that consuming green tea boosts glucose metabolism in humans and can help control blood glucose levels after eating. A scientific study published in the Journal of Nephropharmacology that green tea has an antidiabetic effect. Read more about the amazing health benefits of green tea. Legumes such as lentils, peas, beans and chickpeas are low in fat and calories and also rich in fiber and protein. Dietary fiber slows the rate of sugar absorption into the blood and reduces the glycemic load. They are a great addition to soups, salads and a variety of other dishes. According to a study fresh green vegetable leaves such as lettuce, cabbage, spinach, Swiss chard and parsley, and other green vegetables (fresh, steamed or frozen) such as celery, cucumber, cauliflower, green beans and kohlrabi contain carbohydrates that release hormones in the gut that reduce appetite. In addition, the researchers found that these vegetables improves insulin sensitivity and thus better regulate blood glucose levels. Eating vegetables like asparagus, garlic and Jerusalem artichoke can help in cases of diabetes and obesity, and reduce the risk of type 2 diabetes because vegetables are rich in magnesium and are known as effective antioxidants. Oats contain a high percentage of fiber, B vitamins (especially B1), vitamin E and antioxidants. The large amount of fiber causes a slower absorption of glucose, and combining antioxidants makes the oatmeal recommended food to stabilize blood sugar levels. Click here to find easy and delicious porridge recipes with oatmeal. A medical study found that men who ate the greatest number of apples (and other foods rich in quercetin) had 20% less deaths related to diabetes or heart complications. Other good sources of quercetin are red grapes, tomatoes, onions, green vegetables and berries. Studies show that people with diabetes have lower levels of vitamin C in their body, so rich foods in vitamin C such as berries, citrus fruits, peppers, dark green leafy vegetables, kiwifruit and tomatoes are loaded with antioxidants and are an excellent choice. Those who suffer from diabetes are twice more likely to suffer also from heart disease. A diet rich in omega-3 fatty acids found in cold water fish, can help to lower “bad “cholesterol and raise your “good” cholesterol. Seafood is a great source for omega 3, such as: halibut, herring, mackerel, oysters, salmon, sardines, trout, tuna and cod. Vegetables, especially green leafy ones, such as: kale, parsley, mint, Brussels sprouts, spinach and watercress, are rich in ALA, one form of omega-3 fatty acids (although ALA isn’t as powerful as the other omega 3 fatty acids, DHA and EPA). Ground flaxseed is also a good source of omega 3. Read here more about the fantastic health benefits of omega 3. Cacao powder comes from grinding up cacao beans after removing the cocoa butter (cocoa fat). Cacao powder is claimed to be a superfood because it contains naturally occurring antioxidants with many health benefits. Flavanols in products containing high levels of cacao can help to manage many of the symptoms of diabetes. The journal Antioxidants reported that flavonoids in cacao extracts have an anti-diabetic effect. Cocoa flavonoids can improve insulin sensitivity and reduce blood fat levels (lipids). Researchers suggested that daily consumption of unsweetened dark cacao powder that contains high levels of cacao could help manage type 2 diabetes. However, other studies have not shown conclusive evidence on consuming cocoa-based products with flavanols to manage type 2 diabetes. When using raw cacao powder for helping to prevent diabetes symptoms, it’s important to choose unsweetened cacao powder. This will help to prevent spikes in blood glucose levels. Further reading: Scientifically Proven Health Benefits of Cacao Powder and Dark Chocolate. There are other nutrients in beef other than protein, iron and vitamin B. There is an element which is part of the beef fat which is called CLA (conjugated linoleic acid). The most abundant source of CLA is beef from grass-fed cows. Experiments have shown that CLA works to correct improper utilization of blood sugar and helps fight cancer and heart disease. In a recent study in Norway scientists have added a few grams of CLA to the daily diet of 180 people. They reported that they lost 9% of their body weight in one year. Make sure that the beef is processed as little as possible, as it contains more CLA. Other food sources of CLA in smaller amounts include milk and eggs. According to webMD website, the effect of ACV on blood sugar levels is one of the best researched and the most promising. Several studies have found that vinegar may help lower glucose levels. The European Journal of Clinical Nutrition published a study on a small group of people. It was found that acetic acid has a positive effect on blood glucose and prevented blood sugar spiking after meals. Also, the American Diabetes Association reported that taking apple cider vinegar before bedtime can help control blood fasting glucose levels. It was found that apple cider vinegar has an anti-glycemic effect and can help to control the symptoms of type 2 diabetes. Further reading: 10 Proven Benefits of Drinking Apple Cider Vinegar (Science Based). Particularly interesting is the research into the potential of okra (also known as lady’s fingers, bamia, bhindi or gumbo) in the treatment of diabetes. The studies have only been done on animal models so far and it’s too early to draw any conclusions, but the preliminary findings are promising. A medical study from 2011 showed that okra helped reduce the absorption of glucose and lowered blood sugar levels in rats. Another study on rats was conducted in 2011 and provided similar results (see more information in my article about the amazing health benefits of okra). Bitter melon, also known as wild cucumber or bitter apple, grows in Asia, East Africa, South America and the Caribbean. It is consumed as food and also has many medicinal effects. It has a strange appearance, almost like a bumpy green banana, and contains three different properties that are proven to help diabetics. Clinical studies continue to evaluate the charantin, polypeptide-p, and vicine, each of which have shown an ability to lower blood sugar. You can read more about bitter melon and how to consume it in my article Bitter Melon Can Treat Pancreatic Cancer and Diabetes. This common relative of the ginger family is of popular harvest in southern India, explaining its prevalence in Indian cuisine. While it’s praised by foodies for the earthy and spicy attributes that make so many curries kick with taste, there have also been recent research that suggests turmeric’s effectiveness in treating type 2 diabetes. One medical study focused on the use of turmeric’s active ingredient, known as curcumin, to prevent diabetes from developing as well as giving a considerable boost to liver function. Another study published in an international nutrition journal details the way that turmeric and curcumin administration gave a surprising advantage in lowering the blood sugar and hemoglobin levels within rats. Further reading: Health Benefits of Turmeric + Golden Milk Recipe. What turmeric was to Indian cuisine, ginger is to Asian foods. It also yields similar benefits for people with diabetes. A 2012 study found that the root may help with blood sugar control, producing glucose without relying on insulin. Ginger root can be consumed raw, powdered, extracted into oil and liquids, and in an extracted supplement form. It also has been suggested to help with nausea, heartburn, bronchitis and menstrual symptoms. Further reading: How to Use Ginger as a Medicine. Controlling the symptoms of diabetes is one of the most popular reasons for taking fenugreek extract supplements. A 2017 review of 18 studies into the health benefits fenugreek found that many types of fenugreek supplements are useful for controlling diabetes. For example, one study showed that 500 mg of fenugreek powder helped to control blood sugar levels. Or, adding 15 g of fenugreek seeds soaked in water also prevented glucose levels from spiking after eating. Other studies into fenugreek and diabetes found that fenugreek extracts helped to reduce insulin resistance. Another study found that “fenugreek supplementation modestly improves glucose tolerance without affecting insulin tolerance, body weight, or body composition”. There is also scientific evidence to suggest that fenugreek can help to prevent diabetes. One 3-year randomized, controlled trial found that taking 5 g fenugreek powder twice a day before meals helped to prevent the progression of type 2 diabetes. All of the participants were showing the classic symptoms that they were at risk of diabetes. The research showed that fenugreek improved fasting glucose sugar, glucose levels after eating, and LDL cholesterol. Further reading: Scientifically Proven Benefits of Fenugreek and Its Side Effects. Regularly taking garlic extract supplements can help to lower blood glucose levels. Taking garlic can also help you manage the symptoms of type 2 diabetes. A comparison of studies into the antidiabetic effect of garlic found that garlic supplementation helps to reduce blood glucose levels. Taking garlic supplements up to 1.5 g daily helped to lower fasting blood glucose in 1-2 weeks. Some trials found that tablets of dry garlic powder were effective in controlling diabetes symptoms. Other trials found that garlic capsules enhanced with allicin were also effective in managing type 2 diabetes. Studies using rats found that aged garlic extracts have a strong antidiabetic effect. Scientists noted that aged garlic extract (AGE) were just as potent as fresh garlic in helping to lower blood sugar glucose. Further reading: Medicinal Health Benefits of Garlic (Raw, Supplement) – Science Based. In a 2001 study in Phytotherapy Research, aloe vera extract was shown to help lower the blood sugar levels of rats, laying skepticism of its medicinal use to rest. The study concluded that the pulp of aloe vera leaves is a potentially useful way to treat diabetes. Further reading: Why You Should Start Drinking Aloe Vera Juice. A study by researchers at Mysore University in India explored the potential anti-diabetic properties of cumin seeds. In this study, published in 1998 in the journal “Nutrition Research,” the research team fed diabetes-induced rats a diet of 1.25% ground cumin for eight weeks with positive results. The rats experienced a reduction in hypoglycemia, or low blood sugar — a condition common in diabetics — and glucosuria, in which the urine contains too much glucose. A review of scientific studies confirmed that a number of spices, including cumin, may have anti-diabetic properties. Talk to your doctor about using cumin for blood sugar control. Taking cumin along with diabetes medications might cause your blood glucose to drop too low. If you take diabetes medication, make sure to consult with your doctor first. Further reading: The Miraculous Health Benefits and Uses of Cumin. If you have diabetes, taking one or 2 lemons a day along with the peel could benefit you and reduce your symptoms of diabetes. Research carried out in 2013 found that polyphenolic compounds in lemon peel can help to reduce insulin resistance. The research found that citrus flavonoids help to reduce inflammatory responses and increase insulin sensitivity. Due to its vitamin C content, lemon juice may also control blood glucose levels. Further reading: Scientifically Proven Health Benefits of Lemons. The holistic healing of ginseng has stood the test of time, touted by Ayurvedic experts for hundreds of years. The boost in mental performance, immune system defense, endurance, and cancer treatment are but a few of the benefits that pair with the root’s ability to help treat diabetes. Research from a Croatian university showed that ginseng was able to reduce the amount of glucose in the bloodstream, giving a vital boost for diabetics. It can be ingested in several different ways. Some natural health enthusiasts prefer mixing the raw root into their teas with other herbs and supplements. Others use infusions, extracts, pills, and powdered forms of the root. In summary, these best foods to control diabetes should be added to your daily menu. You can start the day with oatmeal porridge flavored with cinnamon, eat for lunch grass fed beef with poached green vegetables, drink afternoon green tea alongside a red apple, and in the evening eat lentil soup. At bedtime drink another cup of green tea in order to lower blood sugar levels and calm the digestive system before going to sleep. I have been Type 2 diabetic for many years, this article was very helpful.Thanks! Very informative. Thanks for the info. Will try to keep this in mind when I make my food choices. Another good food to add would be almonds – great in fiber and protein. Thanks. with this ailment on the rise across the nation and it running on both sides of my family tree, it is a treat to me. More and more we are being urged to be conscious and careful of what we EAT. Thanks for this articals . I’m not taking any medication, just by diet and gymnema, cinnamon, chromium and am considering adding black cumin, which studies have proven to lower blood sugar. My question is if the person is not taking medication will the be beneficial? I’ve tried oatmeal and it raises my blood sugar. I also understand that each person is different. thank you for the information. 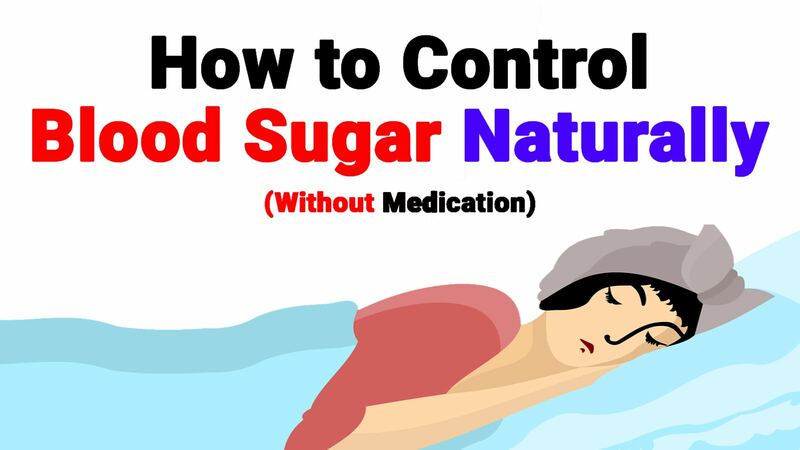 If you have a tendency to have high sugar levels in your blood, your doctor will probably send you to do periodical tests to monitor the sugar levels to make sure they are under control. According to the results, your doctor will be able to see if continuing with your diet is enough or if you may need some medications. The fiber in oatmeal may reduce the absorption rate of carbohydrates, but it is important to note the carbohydrate in oatmeal is quite high. As a Type-1 I choose to avoid oatmeal as the carb load spikes my sugar within fifteen minutes to we’ll above acceptable ranges, even if I take the correct amount of insulin. It also helps to assess what you add to it and to use traditional oat groats instead of instant oatmeal. Steven, oats do the same to me. I just added black seed oil and black seed powder to my regimen, hoping it will help with fasting levels. I notice that wild salmon, cucumbers, wild tuna and romaine lower my blood sugar . I actually feel good with eating no carbs no sugar, clean fresh food. However my levels go up as i sleep and wake with my highest levels in the morning (130-150s) i have noticed that they are higher when i am frustrated or irritated with someone. Anyone notice the same? I also started dandilion root tea and Nettle tea to help regulate. I have found this to be helpful, thank you. I also use lemon juice concentrate to lower my blood sugars very fast. I mix a half cup in sugar free flavored water—it tastes really bad but will lower blood sugar by up to 1/3 or 1/2 in less than 2 hours; at least for me. Wonder how many quick trips to the bathroom is the result as lemon removes toxins from the body. I am diabetic II but have to limit myself to only one glass of lemon-water (due to other digestive issues) with only a couple of dribbles of lemon juice concentratehttps://www.healthyandnaturalworld.com/6-best-foods-to-control-diabetes/ with 8 ounces of filtered water (first thing in the morning). Also for every sip of lemon-water (through a straw to limit acid-access to my teeth) I always follow with a sip & swish in mouth of plain filtered water. on top of the very informative diet beneficial to diabetics, regular exercise is a must…. Thought it was worth a share, enjoy! I am type 2 diabetes and have been using canola oil, but see that olive oil would be better for me with the other health issues I have. I believe coconut and coconut oil would be even better! Check it out – research the internet & these kinds of websites. This information very helpful. I really enjoyed it. Thank you. My suger fles to match up and down. Thanks for helping me how to take care of my body,I have learned a lot. Be careful about overuse of vinegar. I wouldn’t sip it before bedtime as article suggests due to acid reflux. Corrosive to esophagus and stomach lining. Cheryl, my reflux stopped after I started ingesting raw organic apple cider vinegar. My stomach acid is too low and it’s apparently a family thing as I have siblings, my father and several of his family members who also have this issue. They used to think it was too much acid, but it’s not. I do have to be careful when swallowing vinegar. I always dilute it in water. I used to swallow it straight and I liked it but two different times I accidentally inhaled the fumes while swallowing and I about died because I could NOT breathe! If you ingest vinegar straight, BE VERY CAREFUL! This is true for Cassia cinnamon, commonly found in the supermarkets, which contains the compound called coumarin which might interact with the blood thinner warfarin as well as with a number of blood pressure medications if taken in large doses. However the type recommended for diabetics is Ceylon cinnamon – read about the differences between the two in my article “How to Use Cinnamon As a Medicine” – see reference in the article itself. In any case, it’s always important for people who take medications to consult with their doctor about any possibility of interactions with medications. Hi Hilary, always dilute the ACV with a glass of water (and I’m going to add it to the original article, so thank you for your question). Some Natural Food Stores sell apple cider vinegar beverages. I like BRAGGS APPLE CINNAMON. It’s juice, spice, and vinegar. There are different flavors, but the vinegar hides best in apple cinnamon. Call your local natural foods store and ask about it. Do these help regulate the processes involved to balance blood sugar as needed by the body OR do they simply assist raising sugar levels. In other words would these also assist with hypoglycemia? Thks for these lessons. Its life saving and educating.Red wine is believed to be good for the heart if true then to what quantity. Thanks.I got lots of Valueable information. Daily brisk walk for at least 45 minutes is best to control diabetes, it’s my experience. I really enjoyed reading it, I’ve really learned alot. All sounds informative + neccessary for me. I haven’t seen Apple Cider Vinegar in the shops anywhere, do you know which shops stock it in the UK please? Hi Glennys, if you don’t have a health food store in your area, you can order online through Amazon or eBay UK. Buy raw organic ACV. Thanks alot for the information.I have diabetes type 2 and am trying to control it. I wonder when people are trying oatmeal and saying that it spikes their blood sugar levels, are they using instant or slow cooking oatmeal? I am sensitive to sugar but I am going to try STEEL CUT, SLOW COOKING oatmeal. I think the fiber content is higher which should help with the sugar absorption rate. I am also going to add chia and possibly hemp seeds. I will do that in separate meals and check my sugar levels with and without the added seeds. I will try to post my results after a few mornings of figuring out which oatmeal works best for me. I was curious if anyone else had tried something similar? Add bitter squash and black seed to the list, they have shown improvement in numbers. Additionally 10 minutes walk after each meal improves carbohydrate metabolism. This article is really good, and it is a big improvement over the articles that talk in generalities. Like eat more fruit, legumes and fish. I would like to see them go one more step in their recommendations though. How about a suggested meal plan. Not necessarily limited to these 12 foods but mostly these 12 foods. Can they do it? Perhaps 7 breakfasts, 7 lunches and 7 dinners. I’ve to add also the okra and bitter melon just steam and eat raw. Thank you! – To read more about bitter melon and diabetes click here. Am type 2…recently diagnosed…Emergency room, my BS was over 1100…now on insulin..and trying to eat. Try a vegan diet, 2 of my Doctors told me to do this and I do not take any med.s. You can eat some meat, no red meat, but fish and chicken. Good Luck. such as a functional medicine doctor or Holistic doctor. Cut out as much sugar, and honey as possible. Do not eat anything with high fructose corn syrup! Dear friends can try this. My family have long history of diabetes n is always very difficult to control even w medication. Until we being introduce to this . In Indian shop they call it as Meithi seed. In Sheng Siong supermarket u can get it , it name as Fenugreek seed. Everyday, i put 2 teaspoonful in a teapot (brew like tea w hot water) after 15mins drink the water. Is cheap n super effective. I have told some of my friends n it works wonder on them too. Hope this will helps many of u out there. I’d like to add a piece of advice for type-2 diabetes patients. I’m sure they’d feel the difference if they manage to comply. Make olive-leaves tea by boiling for 5 mints 2 handfuls of olive leaves in 1.5 liters of water. Drink a small cup of the cooled tea 10 mints before meal 3 times a day. Keep monitoring your blood sugar level and tell us the result after 1-2 weeks. You are incorrect Mike. Oats are very good for regulating blood sugar levels, and there are many references about it. Good stuff, thank you very much. Try Essiac tea … (Google it !) It is a great food that no one talks about and can be very beneficial to alot of health issues … not just diabetes! Pink rose water three times a day (morning before breakfast, before lunch, before dinner) 1 tablespoon pink rose water add with two table spoon water daily will cure diabetes 1 and 2 permanently forever. It is a magicful treatment. But plz keep in mind that those people will never use or never try this permanent cure treatment who are sensitive to cold or have high blood pressure because of winters. I have shared to help those who are not sensitive to cold weathers. Mi. Will this counter act for me?